San Francisco, CA () - DigitalCustom Group, Inc. announced the filing of a federal copyright and trademark action against Photo Renew, a Florida based business. The action was filed in the U.S. District Court for the Northern District of California. 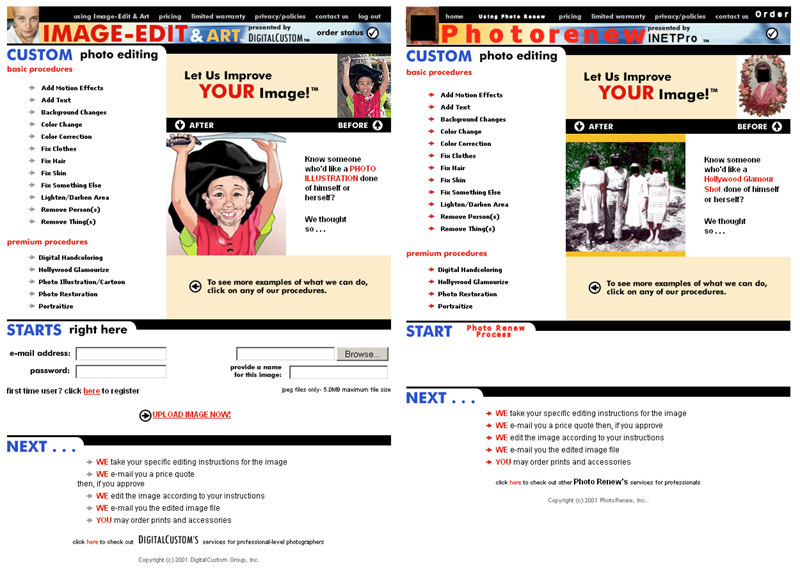 DigitalCustom discovered on June 24, 2001 that Photo Renew had copied the entire public portion of DigitalCustom's custom digital image editing Web site known as Image-Edit & Art (www.image-edit.com). The copying included the source code, text and graphics, creating an online Web site that is virtually identical to Image-Edit & Art -- except that the name Photo Renew had been substituted throughout the site. Comparative screen shots of the Image-Edit & Art and Photo Renew home pages are available at the following links. Aaron Daru, DigitalCustom's Vice President, Operations, said: "We caught them red-handed. We monitor this kind of thing very carefully and will take whatever legal steps are available to stop infringement. Image-Edit & Art is a unique product that we spent time, money and effort to develop. We will protect our intellectual property." DigitalCustom recently filed a patent application that covers several technologies within its system. DigitalCustom further notes that the content of its Web site includes images licensed from third-parties, and that Photo Renew has not paid license fees to such third-parties.